Mini pigs and dogs both make great pets for many reasons. In fact, several of these reasons overlap; mini pigs and dogs are loving, caring, adorable, curious, and entertaining. However, there are some clear personality and lifestyle differences between them as pets. One animal isn’t objectively better than the other one, but it’s important to know the differences when deciding if a mini piglet or puppy is right for you. 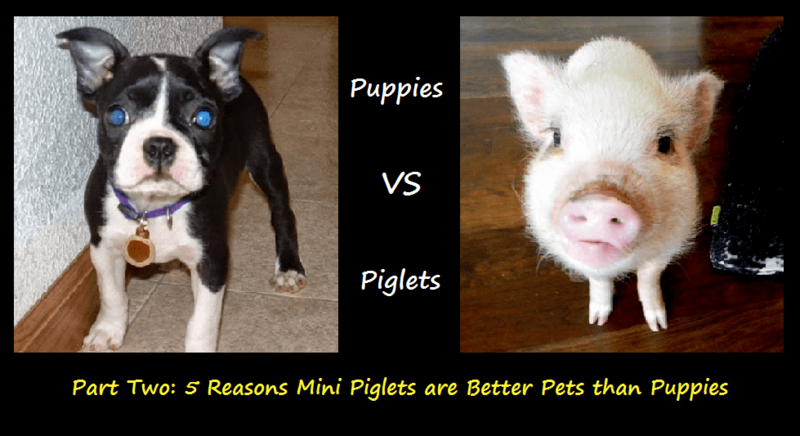 This is my second post in the series, so check out my previous post for the five reasons puppies are better pets than mini piglets. Here are the five reasons mini piglets are better pets than puppies based on our personal experience. 1. Mini piglets and humans can develop a deep bond. Puppies are quick to create a bond with their humans, and most love and trust easily. Mini piglets, on the other hand, take time to create a bond. It takes patience and persistence in the beginning to gain a mini pig’s love and trust. However, once that bond is formed, it can be incredibly strong. In just the past few months, I have been overwhelmed by how much I love Oscar and by how proud I am of the bond we’ve created with him. One of our favorite parts about Oscar is his oddly human-like eyes because we feel like he’s really looking back at us and listening (well, hearing at least!). I’m certainly not discounting the bond between a human and a dog because there is a special loyalty and love that dogs give back but, for me, the bond with Oscar has been different than with our dogs. This might not be the case for everyone and it certainly doesn’t help that I suspect our dog, Rylee, would sell me to a passerby for a cookie, but the deep bond is something special we’ve experienced with Oscar. Oscar’s attentive eyes are one of our favorite parts about him. 2. Mini piglets are calmer than puppies. Puppies have tons of energy! They are playful and love toys, fetch, and other games. Oscar is less energetic and playful than our puppies were, but that also means he is calmer. In general, he makes different movements than a puppy; he is slower paced but calculating. When we pay close attention, we can anticipate what he’s thinking and what his next move will be before he makes it. One thing we had to adjust to was Oscar’s abrupt movements. He will stand in a corner thinking for a few minutes and then bolt across the room all of a sudden. He can run quickly when he chooses to, but for the most part he prefers to noodle around the house for any dropped food bits, cuddle, and eat grass. 3. Mini piglets are less destructive than puppies. By the time our puppies were Oscar’s age, both had eaten something significant in our home. Rylee chewed the drywall off of a wall corner, and Liam ate several books and photo albums. They had tons of energy and turned destructive quickly if they got bored. Oscar will nibble on shoes and the corners of cardboard boxes every once in a while, but he isn’t interested in larger demolition projects like our puppies were. This is a huge plus for our young piglet, but I know that adult mini pigs can get more destructive as they get bigger and their snouts stronger. I’ll update if we have issues with that as Oscar get older! Oscar’s idea of a great day. 4. Mini piglets are cleaner and shed less than puppies. 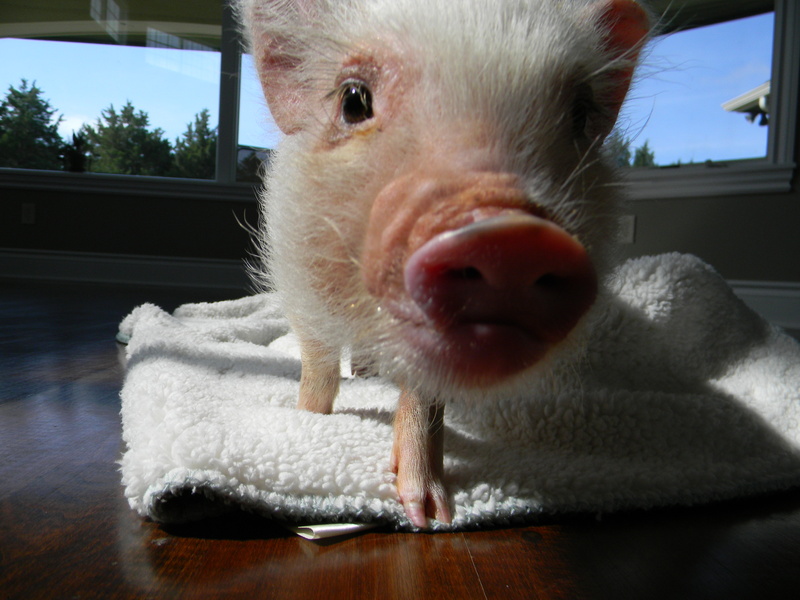 While researching mini pigs before getting Oscar, I was delighted to read that they don’t shed. I haven’t found that to be completely true as Oscar loses some hair around the house, but he sheds so much less than our dogs. Pet hair in the house drives me nuts, so I love that Oscar sheds less. That means less cleaning for me, and my husband is more flexible with Oscar being on the furniture since he leaves less hair behind. 5. Mini piglets are the best cuddlers. All of our pets enjoy cuddling, but there is just something special about Oscar’s cuddles. He really loves to cuddle, and he snuggles in so tight that it seems there’s nowhere in the world he’d rather be. Any time I sit on the floor, he runs up to cuddle in my lap and stays there until I absolutely must move him. He would rather cuddle than play any day, and I’m okay with that. It’s hard to describe what it’s like cuddling with little Oscar, but his snuggles are so wonderful. Of course not all mini piglets and puppies are the same, but these are the differences we’ve noticed in our pets. 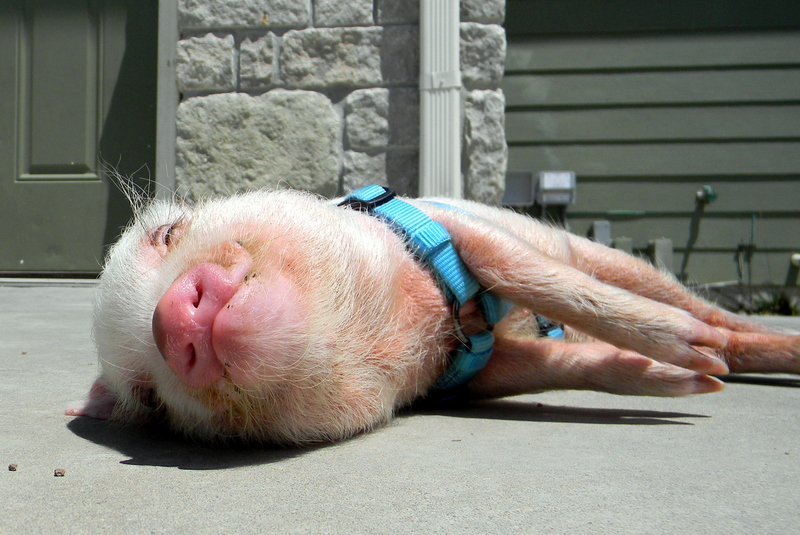 Dogs and mini pigs both make amazing pets for the right homes! If you are trying to decide on a pet, hopefully these puppies versus mini piglets posts help you decide which one is a better fit for you. I appreciate that you point out that piglets are much calmer than puppies. My mom was mentioning to me that she would like to get a dog, but she couldn’t handle the amount of energy that it would have. We talked about getting an older dog, but she wouldn’t want to have it pass away quickly. I’ll have to talk to her about getting a piglet. Perhaps it will be something that she can handle. I am a mini pig parent as well. Reading how you live day to day with Oscar is interesting. You have many useful tips. Keep the posts coming! I agree with all of these so much! Our 6 month old pig sleeps with us in our bed with our lab. (It gets a bit crowded at time but we all love it!) we had to work for his trust and once we had that bond, you can tell he loves us with all of his heart. And likewise! 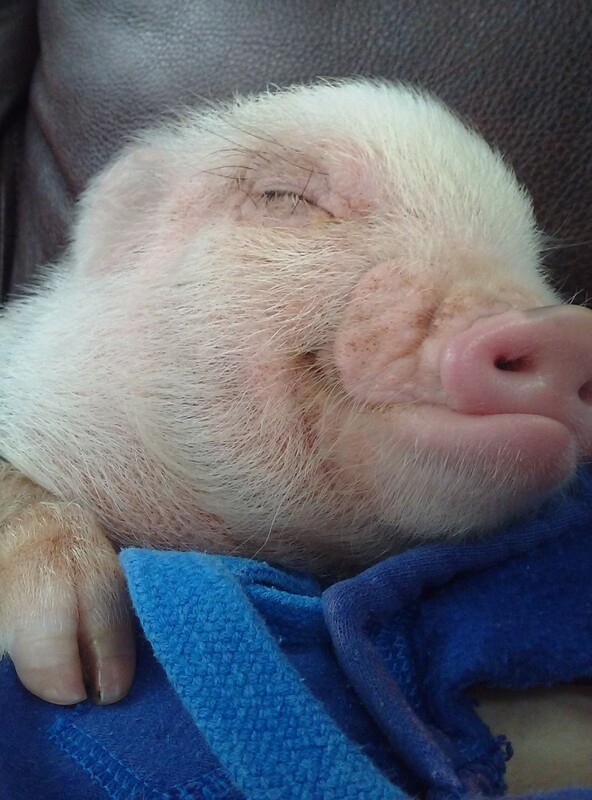 Pigs are such smart, fun, loveable animals.